Media reports about alleged migrant slave markets in Libya have resulted in strong reactions across the continent. African politicians demand an investigation and the prosecution of those responsible. Who's the highest bidder? 800 Dinar! 1,000 Dinar! 1,100 Dinar! In the end, the winning bid is 1,200 Libyan Dinar - the equivalent of $800. A done deal; however, this isn't just any auction for a car or a piece of art. What's being sold here is a group of frightened young men from Sub-Saharan Africa. The low-resolution images, apparently taken at a market in Libya earlier in 2017 were shown on the US-based network CNN last week, which looked further into the issue. Journalists working for CNN discovered several such slave markets in the country's interior, proving what experts had feared for a long time: migrants trying to reach Europe via Libya continue to be subject to abuse. Politicians in Africa have expressed their outrage at the scandal - especially in West Africa where most African migrants originate. President of Niger Mahamadou Issoufou felt particularly revolted by the reports, summoning the Libyan ambassador to Niger and demanding the International Court of Justice to investigate Libya for trading slaves. The issue has made waves in the Ivory Coast itself -- 155 Ivorian refugees, including 89 women and underage migrants, were returned from Libya to the Ivory Coast earlier this week as part of a reintegration initiative launched by the European Union. Representatives of the Ivorian government, however, said that the health of those migrants returned from Libya was in a "deplorable state." UN Secretary-General Antonio Guterres said in New York on Monday that "slavery has no place in our world and these actions are among the most egregious abuses of human rights and may amount to crimes against humanity," appealing to the Libyan leadership to investigate these cases and bring those responsible for the slave trade to justice. He said that he had asked all relevant UN departments to investigate the issue further. 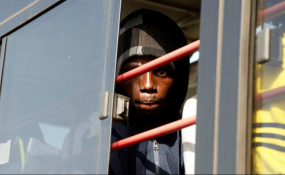 "Libya was hell," says Souleymane, a young migrant from the Ivory Coast. He told DW that he was held captive in the North African country for month. Only by chance did he manage to return home with the help of an initiative launched by the UN's International Organization for Migration (IOM). Fighting human trafficking in northern Africa has been a top priority for the UN for years. However, there's little progress; on the contrary, the practice appears to have intensified in recent years, says Othman Belbeisi, the IOM Chief of Mission in Libya.